Each day this week, I'm looking at my list of top public artworks, and the traits they share that make them great. On certain nights throughout the year, down the center of the Providence River, wood fires in iron baskets hovering above the water are hand-stoked by volunteers drifting by on boats, cloaked in darkness, shadow and smoke. Embers swirl, fires crackle, and you need a cosmic chiropractor if you are unmoved by the visual poetry of it all. One can almost imagine mythical creatures summoned by the scent of woodsmoke and the hiss, rush and crack of fires, each in various stages of ebb and flow. Some roar up in a shower of sparks, some silently glow until once again fueled, all reflected up and down this urban river uncovered in a brilliant act of civic re-planning and modern archeology. Its elements—water and fire— are elusive. 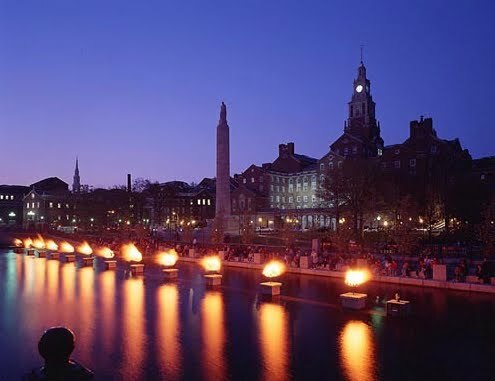 Its seasonal presentation creates an act of communal ritual that makes Providence’s WaterFire a large-scale piece of community-forging performance art that seduces, transcends, engages. It speaks to our primal roots and our ingrained desire to gather at fireside or water’s edge. Brown Alumni and creator of WateFire Barnaby Evans has experimented with the mystical and mythical combination of fire and water in various places and temporary installations before, but this permanent piece has created a mesmerizing center to the elegant Renaissance of a once-gritty little college town (home to RISD, Providence College and Johnson and Wales, to name a few). He’s managed to combine a sense of the ancient, and a sense of the new, and knit a place together with wood and water. It brings people together… from the hundreds of volunteer firemakers to the mesmerized viewers and visitors along the riverbanks. Its scheduled lightings create a buzz and sense of occasion that many urban centers would kill for. “When’s the next WaterFire?” is a local (and tourism) catchphrase, proving that Art might just be good for Business, after all. And on that business end of it, Providence has done an exceptional job of keeping the events more festive, less carnival. Even necessary corporate sponsorship is handled gracefully, and never overshadows the sense of reverence or the hushed sanctity of the event. Piped in “world music” doesn’t demean the basic and elemental nature of the piece, although it would all work brilliantly without it. In our often art-critical society, sometimes the best measure of the success of public art is that visitors are unaware they are looking at Art at all. On the brisk October night when WaterFire first entranced me, there was also a special installation of media artist Jenny Holzer’s, whose cryptic yet familiar words were being projected onto the newly opened (and marvelous) RISD Library. A bit of a darling of the art world, the cerebral Ms. Holzer can be an acquired taste. As her words and phrases flowed up out of the water on the façade, a family passed before me, stopping at Ms. Holzer’s temporary installation. The patriarch chuckled to his family, “What the hell is that? 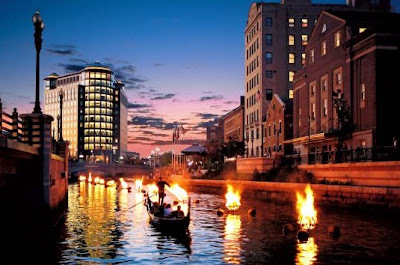 I just don’t get art.” They then continued to stroll down the Providence River, drawn here by the deceptive art of WaterFire, basking in their own silent, but glowing, art review. 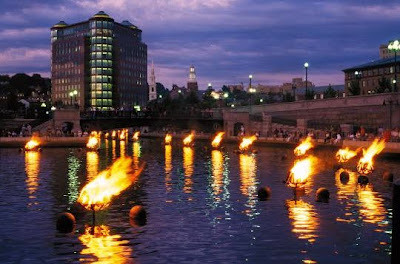 You can follow WaterFire on Facebook.